Our annual Colorado Police Protective Association Conference was held at the Sheraton Denver Downtown Hotel. 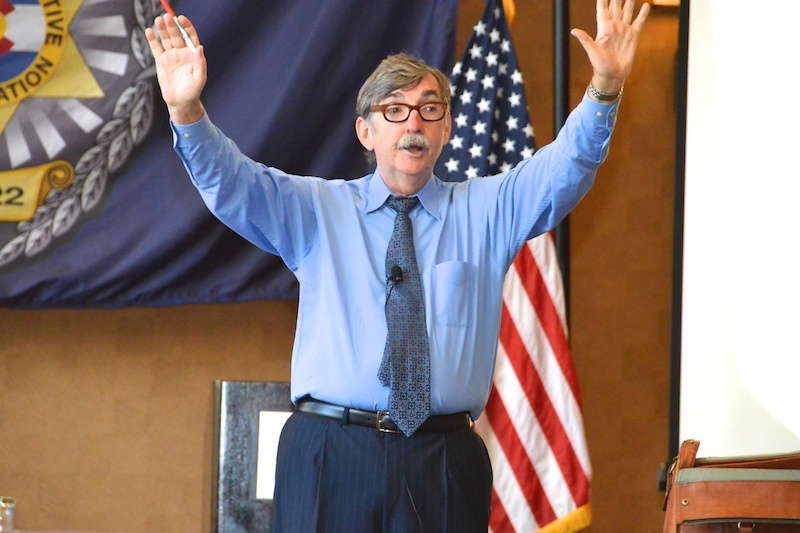 Gordon Graham was not only engaging and kept the audience in stitches with his humor and real life anecdotes, but he provided valuable information to the officers on how to make their careers successful. 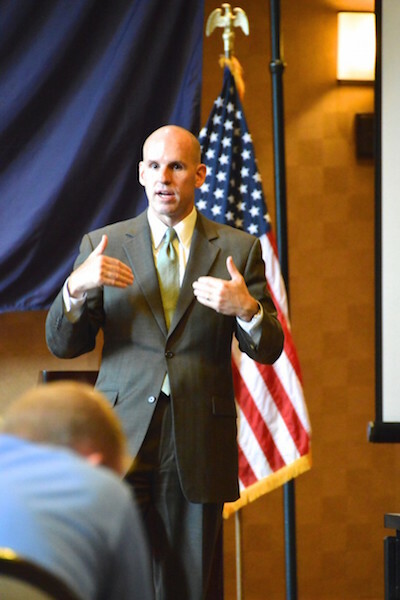 He spoke about risks that Law Enforcement Officers take that can often be avoided, how to make ethical decisions and what the most common mistakes are that get cops in trouble. We finished our day of training with a few words from Mike Lowe, with Bruno, Colin and Lowe, PC, that only reinforced what Mr. Graham had been speaking about all day. After training on Friday, we conducted our Annual Business Meeting where the CPPA elected its new Executive Board. We would like to congratulate, President Suzette Freidenberger, Vice- President, Ben Leach, Secretary, Nikki Thomas, and Treasurer, Paul Frey, Members at Large; ScottCavenah, DustinTaylor, and newly elected Cindy Cohn. Jeff Clayton of Lombard & Clayton, LLC. gave an update on the legislative issues going on over the last year and what to expect in the coming year. We had an array of vendor participation this year. We hope that everyone who attended the conference was able to take time to learn more about what these great vendors had to offer. We hope to welcome all of these folks back plus many more next year! Friday evening the conference attendees enjoyed the social hour at Katie Mullen's Irish Pub, which included great food, drinks and the chance to interact with all the attendees. The food was great and so filling, we really did not have to eat dinner that night! We brought back the CPPA Fire-arms Match this year, which was held at the Highlands Ranch Training Facility. While the participation was lacking this year, the quality of shooters was not. Each participant went home with great prizes and got the opportunity to shoot some different firearms that Victory Defense brought out to show off. We held the pistol match Saturday, August 16th on the ranges of the Highland Ranch LE Training Center. The weather was perfect for the event and everyone involved offered up their best effort in the pursuit of speed, accuracy and sportsmanship. We awarded some very nice LE and firearms related prizes to all the shooters. The first and second place shooters received $500.00 gift certificates from Adamson’s Police Products. All the competitors won prizes. I’ve always thought that everyone should win something at a match and the CPPA board allows the match funding to do so. Saturday night brought our annual awards banquet with almost 70 in attendance. We enjoyed a delicious dinner and the company of not only our own Law Enforcement Officers in attendance, but many of their families as well. Dr. Tony Kern was our Keynote Speaker. Dr. Kern spoke about “why good enough, really isn’t” and encouraged everyone to put forth their best effort, every time and in full compliance. We awarded 28 scholarships this year after having 49 applicants. We are very proud to be able to present our members and their children with scholarships to further their education. Congratulations to all recipients! We presented several officer awards this year with 9 Honorable Mentions to officers who were nominated by their peers for either Officer of the Year or Distinguished Service. We were honored to present the Distinguished Service award to Duane Morton of the Delta County Sheriff Department for his many years of service and numerous accomplishments during that service. Our Officer of the Year was awarded to Shane Gosnell with the Colorado State Patrol after he took the fight to the suspect who had already shot Gosnell’s partner. Gosnell acted without hesitation and ended the fight by stopping the threat and ultimately saving the other Trooper’s life. It is an honor to present these awards to these two brother’s in blue. The Colorado Police Protective Association would like to thank everyone who came out this year. We look forward to our conference next year and for the new things ahead. If you need any assistance or have any comments or suggestions please do not hesitate to contact our office at cppa@cppa.net or call us at 1-800-320-2772. As always, stay safe and know we are here to serve.